As little T.Puzzle is passionately fighting to be independent, he’s had some serious behavioral infractions and a series of time-outs and tantrums. These have all been meticulously documented by me on this very blog. I thought maybe I would share some good stuff so I don’t get stuck in a woe-is-me rut and T.Puzzle can only partially blame me for his possible future emotional dysfunction. 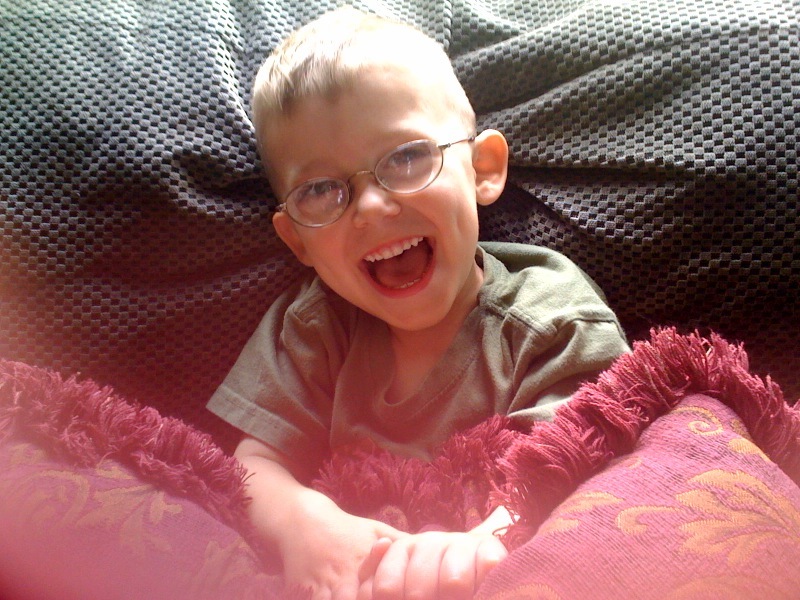 And, I wanted to do it because sometimes this kid can be really, really cute. 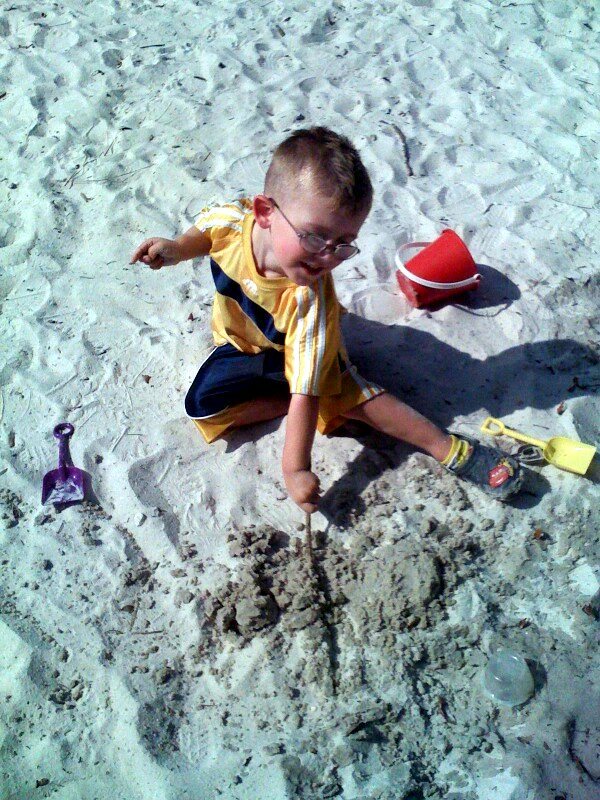 The first picture is of him playing in the sand at a nearby park. My friend and her baby walked with us there. Little T.Puzzle tried to act as if my friend was his personal assistant. He immediately starts ordering her around and telling her where to put the water, the bucket, etc. He is very directive just like his brother and father before him. And you wonder why I have issues? Anyway, he had a blast and he was a lot of fun to watch as he attacked the sand with gusto. My friend was gracious and patient with him as always (thank you!). This second picture shows that even though he craves independence, he doesn’t ever like to be left alone even if I’m only in the next room. On the days it’s the two of us, he follows me from room to room about 90% of our day. 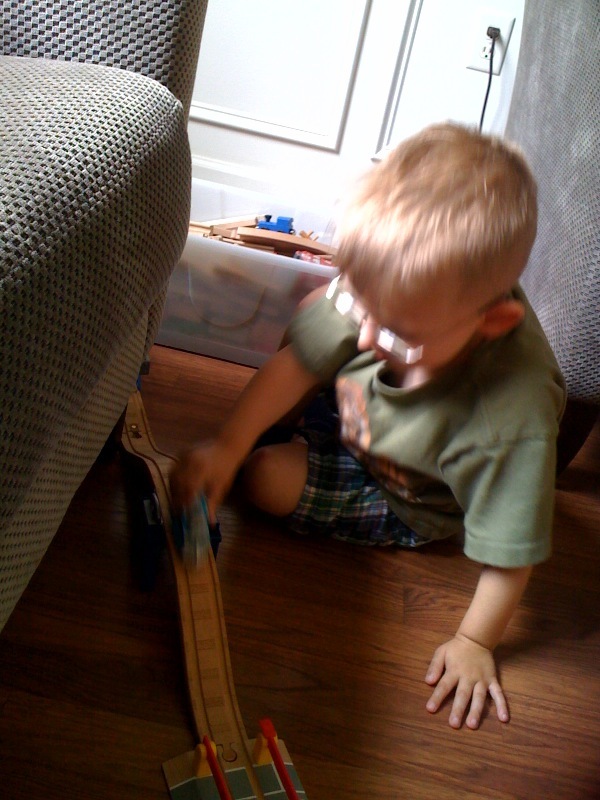 Here he is playing with his beloved Thomas the Train at my feet while I blog. He knows enough to leave Mommy alone when she’s typing but there are times he still manages to put his feet (yes, his feet not his hands) or his Thomas the Train on the keyboard just to make sure Mommy is paying attention. This third one is to show how marvelous his dimples are! I mean with a smile like that, this kid could get away with just about anything. I posted these pics to remind myself tantrums and/or aggressive behavior do not ultimately define my little T.Puzzle. They are just a small part of him and all the other parts like tenacity, creativity and zest for life are pretty spectacular. very cute post…I do like how he is able to give his orders to get his sand creation constructed….the second photo is very cute and I am learning a lot of Thomas the Train these days…I can picture that lil toe now creeping up the keyboard (this made me really lol)…and the third picture is just priceless…those lil dimples are a heart melter for sure!